Bill didn’t really care about managing his diabetes; what he did care about was panning for gold in the Colville Valley. 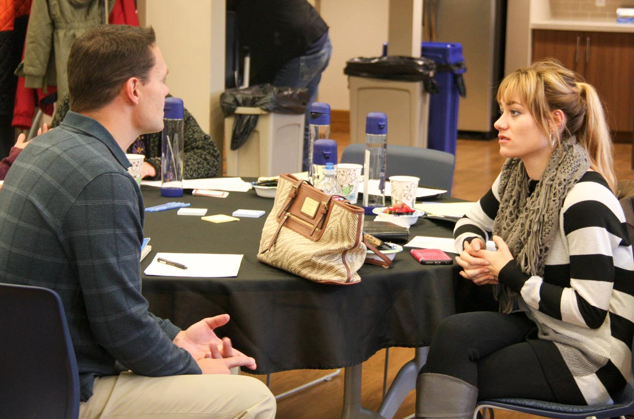 So began a convening of EHF health coaching partners this past fall. The day brought together a cohort of peers serving the aging community across Eastern Washington. What surfaced from the event was a great sense of peer support and learning, and an excitement to continue sharing ideas and strategies. EHF’s Aging Services Partners came from all over the region in celebration of health coaching successes. Health coaches from throughout the region shared stories of the positive impact they create for seniors, and the coaching styles that bring success to their work. The common themes of compassion, understanding, and trust emerged across all the stories in the room. Our health coach partners overwhelmingly agreed that it is essential to listen to what their clients find most important. By addressing goals that are meaningful to the clients, the coaches can introduce how health plays a part in achieving those goals. David Donally, Aging and Long Term Care of Eastern Washington, and Nina Adams, Rural Resources Community Action, exchange coaching strategies. David recommends being authentic and trusting the client. He tells the senior he works with “you are the expert here; you know what you want”. Bill hadn’t been out panning for gold in years. Complications from his diabetes made it too difficult to go. Bill didn’t know how to lower his A1c and didn’t think there was anything he could do to get healthier. The story of “Bill” represents many of the clients served through EHF’s Aging Services portfolio. Pam Snider from Rural Resources Community Action explained that she tries to “meet clients where they’re at” in order to have the most impact. Pam worked with Bill on his diabetes. During their weekly coaching sessions, Pam learned about Bill’s desire to get back to panning for gold. Knowing this goal, she helped Bill see how lowering his A1c could get him out in the mountains again. Pam was able to frame the conversation of improved health and higher activation in the context of something that was meaningful to Bill. Pam’s story of Bill reminds us that the work we are doing creates better health outcomes and quality of life for older adults in our region. The day gave our health coach partners the space to share what supports they need to better serve their seniors. We learned that a main concern for our coaches is getting seniors connected with the resources and services that will help them remain independent and thrive. Nina Adams from Rural Resources Community Action spoke to the systemic issues facing seniors in the community, including affordable housing, access to healthy food, and transportation. “How can a senior afford a healthy diet? How can they eat a healthy diet on food bank supplies? There are issues we see but cannot always fix,” Nina commented. We learned another significant need for our coaches is self-care training related to grief and loss. Serving the elderly can be difficult work that requires dedicated individuals, and burnout is a hazard. Our partners requested technical assistance for the development of coping skills to manage the stress and grief that comes with serving a vulnerable population. From left: Shivon Brite, Empire Health Foundation, and Alison Ball, Confederated Colville Tribes, discuss support needs for health coaches. Alison Ball urges that health coaches need assistance with the grief process. Our partners found that networking with peers, both at the service provider and administration levels, was a great benefit to their work. Terry Titmus with Rural Resoures Community Action noted that he looks forward to learning of opportunities to capitalize on the efficiencies that others have discovered. From left: Terry Titmus, Rural Resources Community Action, and Wendy Thomas, Kalispel Tribe of Indians, found value in networking.